As a public event, the Preparatory Seminar not only aims to prepare the Insight China delegation for the subsequent On-Site Seminar in China but also welcomes visitors from in- and outside the University as well. Thanks to numerous high-profile speakers as well as engaging workshops and discussion panels, the participants gain key knowledge for understanding today’s China. The first day was filled with presentations and workshops revolving China, such as its history, language and culture. Among the workshops was Qi Zhu-Ammann’s, Managing Director at Confucius Institute at the University of Basel, where she gave the participants a brief but essential introduction in the Chinese Language, its pronunciation intricacies and regional differences. 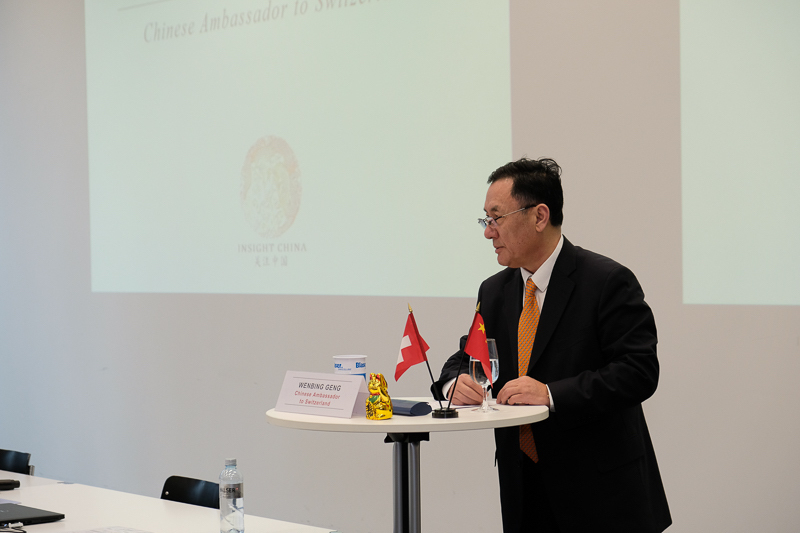 The following Tuesday comprised of several notable guests—the Chinese Ambassador to Switzerland, his excellency Geng Wenbing being the first. He talked us through the history and evolution of China, by highlighting the developments of China since the Opening Up and Reform efforts, when China has entered a new era in 1978. He continued by explicating how the Communist Party of China (CPC) in 1921, and in 1949 the People’s Republic of China came into being. Moreover, to mark the 100th anniversaries of these two important dates, the CPC set goals that are to be met by 2021 and 2049. Read all about the speeches, workshops and discussions of this year’s Preparatory Seminar on the Insight China website. Highlights included an interview with Uli Sigg; a panel discussion with Nico Luchsinger (Asia Society Switzerland), Martina Fuchs (CNN Money Switzerland), Michael Jeive (FHNW) and Thomas Christ (Swiss Chinese Chamber of Commerce) and a speech of the Chinese Ambassador to Switzerland, his excellency Geng Wenbing. By 2021, the goal is to “build a moderately prosperous society in all respects”. This essentially means making sure that China’s development improves the lives of all its people, particularly those who are below or near the country’s poverty line. By 2049, the centenary of the People’s Republic of China, the goal is to “build a modern socialist country that is prosperous, strong, democratic, culturally advanced and harmonious”. Staying on the topic of history and diplomacy, the next guest Mr David Braun conducted a speech about the Swiss-Chinese relations. Mr Braun is the Regional Coordinator for East Asia at the Federal Department of Foreign Affairs FDFA. He stressed that “China’s rise is a renaissance and seeking cooperation and addressing differences is important. Giving a final message to the students, he cited Albert Einstein, “The only source of knowledge is experienced” and encouraged us to study and experience China further. The morning continued with an interview of Dr Uli Sigg, businessman, art collector and most notably, Former Swiss Ambassador to China conducted by Insight China Project Team member Nadine Hitz. She inquired about his positions as ambassador, education in China and his motivation for curating Chinese contemporary art. On the question where he sees the difference between Swiss and Chinese students, he underlined that the Chinese students are extremely ambitious. Consequently, for Chinese families, even the choice of the kindergarten is carefully made and going to University is viewed as essential for the young Chinese population to succeed. His visit was then concluded with an open and insightful Q&A session. In the afternoon, Mr William Leigh-Pemberton, the Strategic Development Director at Bertschi AG, presented the opportunities along China’s New Silk Road and the details of the Belt and Road Initiative. He explained the challenges of doing business in China and how success is achieved in the eastern region. He emphasized one such challenge for the west—that China is a fast-moving economy. To win in China, Mr Leigh-Pemberton advised that companies should respond quickly to customers and that a highly motivated and content team is crucial to succeeding. 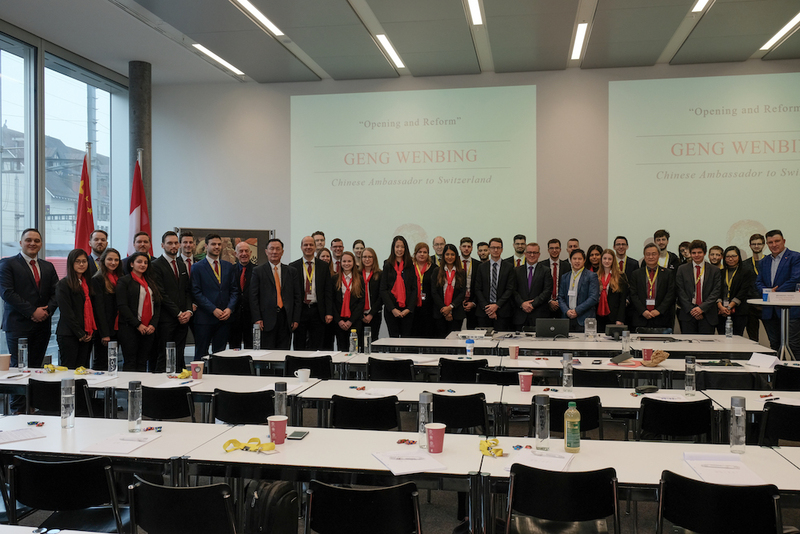 On Thursday, Dr Heinrich Siegmann of the organisation SwissBanking kicked the day off with a presentation with facts and figures about China’s efforts in internationalizing their currency and foreign financing endeavours. He explicated how China already contributes to around one-third of total world economic growth and that by 2012, more than 10,000 financial institutions worldwide were doing business in RMB, manifesting the currency’s dominant position in the global economy. Furthermore, globalization would not have been possible without competitive and growing banks in China. Afterwards, the seminar resumed in the afternoon with Thomas Christ of Swiss Chinese Chamber of Commerce joining us. He showed that Switzerland is seen as an innovative and highly organized country by Chinese people. He described the assumption that Chinese people are good at copying things but added that Chinese are also better in organic innovation because they create cheaper and more high-quality products. However, in terms of disruptive innovation, China has potential. Consequently, people are becoming more afraid of China and the question for the future arises—if we need to be wary of the dominance of China or embrace it. The last event of the day was the panel discussion between Nico Luchsinger, Co-Executive Director of Asia Society Switzerland; Martina Fuchs, CNNMoney Switzerland TV Anchor; Michael Jeive, Head FHNW China Centre Research and Consultancy and Thomas Christ, who previously held his presentation. The first matter at hand was China’s positions in the world stage, where our panellists discussed geopolitical motivations, economic benefits and international relations. The latter part of the panel then touched on the subject of challenges and outlook for China, discerning its imminent problems such as slowing growth, sustainability and moral questions regarding their foreign investments. They further discussed how the protectionist policies of the US endanger its dominant position in the world stage and that the remaining developed world might further lean towards China. Furthermore, China’s motivations regarding its economic expansion efforts and investment strategies remain opaque and pose an important and complex topic. The panellists also talked about Chinese M&As in Switzerland and the passivity of China regarding influencing Swiss businesses, surmising possible motivations. As the year draws to a close, one is tempted to reflect all key events from the preceding 12 months and to look forward to a year ahead. However, it seems in 2018 that events are moving so quickly that there is barely time to reflect, or that one’s preliminary conclusions are overtaken by rapidly changing circumstances. The 40 years since 1978 have brought remarkable and unprecedented change, the few tables below Identifying just some of the areas of radical change and progress. An extensive survey of the reform period, and source of the tables above, has recently been published by the Australian National University Press (see link in reading list below). While the national press in China will no doubt feast on the celebrations much of the rest of the world may be more focused ongoing trade war and its impacts. Next week is also likely to see the launch of the annual Central Economic Work Conference which convenes to define the agenda for the following years key economic policies. The event is normally meticulously planned in advance with policies debated, discussed and consensus created before the formal meetings. Today it is not clear whether the recent Xi-Trump Dinner at the G20 in Argentina will lead to significant changes in China’s 2019 policies and priorities. The Trump-Xi meeting on the sidelines of the G-20 Summit over the weekend has brought a temporary trade truce between the world’s two largest economies. While Beijing and Washington both called the meeting “highly successful,” the two governments have described the results quite differently in their respective statements. To provide you with a more nuanced understanding of the Sunday meeting and the progress of trade talks, Caixin has put together a side-by-side comparison of the two statements, as well as the joint statement released in May following Vice Premier Liu He’s round of negotiations with U.S. Trade Representative ‎Robert Lighthizer‎ in Washington. What happened: Inside the car, Trump dictated a statement to Sanders listing the concessions he said China made during the dinner, according to two sources familiar with their private conversation. The statement, which was circulated to principals, was all Trump. Since then, we’ve seen a mess of competing and confusing statements from the Chinese and American sides, throwing U.S. stock markets into a spiral. In our last newsletter, we discussed the US China trade war arguing that “It is precisely here that we see the nexus of the rising conflict between the US and China – not simply trade, but technological capability. The Made in China 2025 (中国制造2025) programme aims to comprehensively upgrade China’s technological capabilities reducing its dependency on western developed economies”. The full impacts of the conflict are still to be seen, but some initial winners and losers can perhaps be identified. In recent days we have seen more and more reports that Beijing is willing to modify the Made in China 2025 (中国制造2025) programme to open market access to more foreign companies. While the recent Xi-Trump Dinner at the G20 in Argentina offered some hope for a softening of the dispute and appeared to signal a willingness on both sides to return to negotiation and compromise, the arrest of Huawei CFO Meng Wanzhou and the news on December 11 of the arrest in China of a former Canadian diplomat offer evidence of a hardening of approaches. In a recent page three editorial in the Party’s official People’s Daily newspaper, China’s leadership makes the sternness of its position known in regard to the arrest in Canada of Huawei CFO Meng Wanzhou (孟晚舟), the daughter of the company’s founder. The commentary is attributed to this “Zhong Sheng” (钟声), a pen name used in the paper since November 2008 for important pieces on international affairs on which the leadership wishes to register its view. The name “Zhong Sheng”, literally ”bell tone”,is a shortened version of “bell tone to warn the world” or jingshi zhongsheng (警世钟声). But it is clear from the piece that the Chinese leadership, at least publicly, does not view this as a legal case at all, but purely as a political move on the part of the United States and Canada. Looking forward there seem to be more questions definite answers. Is Beijing ready to deliver on the reform promises of the 2013 Third Plenum? Will Xi Jinping use the Reform and Opening anniversary commemorations to announce major economic reforms and further opening? What impact will US and European pressure and the needs of the Chinese economy and enterprises have on the (re)formulation of the Made in China 2025 policy? While there seems little or no evidence for political reform or a loosening of the ideological party direction, there appear to be a growing number of voices within the country pushing for greater economic openness. The news is full of reports on the current trade tensions, trade war or conflict between the USA and China. What began with a gradual changing of positions, especially in the USA between 2016 and 2018 has rapidly escalated. The attitude towards China in the West, initially in the US, but also across Europe has hardened significantly. Internationally, the prospects of some form of conflict (whether trade conflicts or otherwise) between an increasingly assertive China and other regional or international powers is on the rise. While in the US a populist president attempts to energise his grassroots support by focussing his ire on perceived enemies both within and especially without US borders, within China the US is increasingly perceived as attempting to halt China’s natural rise back to regional if not global pre-eminence. While it may be anathema for liberals, the use of trade as weapon is a traditional realist or geopolitical approach. We should not forget that the vast majority of governments across the globe are not simply liberal, and that both the US and China as well as most Asian governments fall into this category. A realist or realpolitik approach, epitomised by many by former Secretary of State Henry Kissinger (who negotiated the US/China détente during the Vietnam War to take advantage of and exacerbate Sino – Soviet tensions thus weakening the Soviets in the Cold War) would see maximising national power as the greater goal. Realists tend to see global political and international relations as geopolitical game whose rules change little over time. The struggle for power and influence, the mobilisation of partners through alliance formation or vassals states through clientist relations, conflict, war, scarcity and economic competition—all of these are seen as constant patterns and modes within an anarchic global system and they endure despite changes over time in ideologies, institutions, or technology. Political liberals might point to the abolition of slavery and the diminution of great power wars as signs of enlightened human progress. Political realists might point instead to the brutal similarities, despite the passage of some 2,500 years, between how the powerful Athenians treated the weaker Melians in ancient Greece and how the stronger Serbians treated the unarmed Bosnians of Srebrenica in the modern Europe of the 1990s. Although realists recognize the potential for cooperation and peaceful relations among states, they tend to be pessimistic regarding the human condition and political behavior. Realists emphasize the fallibility rather than perfectibility of human beings or, as Robert Gilpin once put it, political realists “never had much hope for the human species to begin with” (Gilpin 1996, 3). Yet, in China’s view, what the U.S. is really reacting to is not only the specifics of its trade policy, but also its overall development model and its aspirations to become a major global power — aspirations that are not out of reach. In fact, the Chinese believe, Trump’s trade war effectively proves that China has become a real and present threat to American hegemony. Whether this is true or not is irrelevant; what matters is Chinese perception. Whereas in the past, when only a few conservatives warned of U.S. attempts to “contain” China, virtually everyone in China now buys into this narrative, including a growing number of young people. Having grown up amid prosperity and confidence, exposed to Western lifestyles and educations, China’s millennial generation — born in the 1980s and 1990s — were supposed to usher in an era of even greater openness and freedom. Yet these young people — who have previously reported much warmer feelings toward Western countries and Japan than their parents and grandparents — are having their faith in Western ideas tested by Trump’s actions. While a full-blown return to Maoist policies is still barely conceivable, it is clear that the post-Bo New Left have been emboldened in their criticisms of the liberal order, more insistent in their calls for red songs and red culture and more determined that the political, and especially orthodox party political views must be upheld in all places at all times at all costs. This has included the quashing of dissent; politicisation of the anti-corruption activities; demands for CPC leadership in all aspects of society; confirmation of Xi Jinping as Core Leader & Helmsman, removal of term limits for Presidency (and Vice-Presidency) and enshrining of Xi Jinping Thought on Socialism with Chinese Characteristics for a New Era in the constitution. One key element in this calculation is the concept of Comprehensive National Power. The ideas itself has ancient roots, but in its modern form is related to the idea of soft power suggested by Robert Nye in his 1990 book. Soft Power is the power of influence which acts in addition to the hard power of military force. In the nineteenth century, the UK used its cultural power to influence the most powerful families in its imperial dominions, bring their sons (and later daughters too) to Oxford and Cambridge, their military officers to train at the elite officers schools in the UK and promote English literature and science as the global bench mark. Substitute Harvard, Stanford and Caltech, and US policy is much the dame today. China increasingly invites the children of elites in Africa to study at Peking University, some of these probably the grandchildren of those who studied at Oxford. However, Comprehensive National Power is more than just hard and soft power. There are various methods for calculating CNP, but include aspects including Critical mass (land, population, energy and resources), economic strength, technological strength, military strength and cultural appeal. It is precisely her that we see the nexus of the rising conflict between the US and China – not simply trade, but technological capability. The Made in China 2025 (中国制造2025) programme aims to comprehensively upgrade China’s technological capabilities reducing its dependency on western developed economies for key components especially semiconductors (see the ZTE crisis). Central to a realist geopolitical approach would be to consider the ultimate interests and therefore goals of the conflict parties. China’s goals appear quite transparent – their policies laid out in plans and policies. The US appears less certain in its ultimate direction, but increasingly determined in its approach. And it is worth remembering that Beijing’s endgame is not necessarily to ensure the financial health of its country this year or the next. If China were to suffer short-term pain to gain a real and lasting advantage over the United States — or at least not lose any advantages it does have — it might be willing to struggle a bit today. The current direction of travel of the US- China Trade War is certainly troubling, but not necessarily surprising when considered from a realist perspective. Some elements in both camps are lobbying for a meeting between Xi Jinping and Donald Trump on the fringes of the upcoming G20 summit. According to the Wall Street Journal “Mr. Trump has dedicated a team to plan for his summit meeting with Mr. Xi, … One of the people involved in the planning is Christopher Nixon Cox, grandson of former President Richard Nixon, whose trip to China in 1972 eventually led to diplomatic relations between the two nations. Meantime, the planning team on the Chinese side includes Liu He, Mr. Xi’s economic envoy…The plan is to get Trump in a room with Xi, get a small win and declare an end to the whole thing,”. However, there are strong forces in both Washington and Beijing arguing forcefully against such a compromise and for a decoupling of the US economy from China and at the current moment; it appears the hawks may have the upper hand. Will Beijing be willing to suffer short-term pain in the form of falling orders and negative economic impacts of the Trump Tariffs in the hope that it can hold out until rising prices in the US and the impacts of its own targeted tariffs erode support for the current US policies? Might global US corporations influence their own governments policy and put their weight behind the doves in the administration? The outcomes of the current trade conflict are unclear. In times of such uncertainty, it would be advisable for those closely engaged in international relationship with China and the US to revisit their risk assessments. For international companies dealing with the US and China the geopolitical situation has become increasingly volatile, uncertain, complex, and ambiguous (vuca). Their risk analyses need to be constantly updated and should ensure that political risk is included and weighted as highly as more traditional business risks. For scientific collaborations, the technology transfer clauses in agreements need to be carefully checked and new agreements drafted to ensure that win-win is not just an empty phrase. For all of us, we might hope that calmer heads on both sides will prevail and this trade war does not develop into a more dangerous conflict. Huang, S., 1992. On comprehensive national power – zonghe guoli lun. Beijing: Chinese Social Sciences Press. Nye, J.S., 1990. Bound to lead: the changing nature of American power. New York, NY: Basic Books. Die Schweiz hat die Volksrepublik China als eines der ersten westlichen Länder anerkannt. Eine wirtschaftliche Strategie fehlt jedoch und muss rasch ausgearbeitet und konsequent umgesetzt werden. Die Schweiz nahm in den bilateralen Beziehungen zu China immer eine Sonderstellung ein. 1950 war die Schweiz eines der ersten westlichen Länder, welche die Volksrepublik China anerkannte. Mittlerweile bestehen über 30 offizielle Partnerschaften zwischen Schweizer und chinesischen Städten, Kantonen, Regionen und Provinzen. Die älteste Partnerschaft – zwischen der Stadt Zürich und Kunming – feierte im letzten Jahr ihr 35-jähriges Bestehen. Das Freihandelsabkommen und die strategische Partnerschaft im Bereich Innovation bescheren der Schweiz erneut eine Ausnahmestellung – doch das Zeitfenster, diesen Vorteil zu nutzen, ist begrenzt. Denn China ist gemäss Plan auf dem Weg zur Vormachtstellung auf der Welt. Die Entwicklung wird dabei nicht konstant vonstattengehen. Vielmehr werden sich die Aktivitäten Chinas in allen Gebieten expansiv sein wie nie zuvor. Darum muss sich die Schweiz vertieft mit China auseinandersetzen, Wissen über China schaffen und dieses den relevanten Akteuren zur Verfügung stellen. Ziel muss sein, eine breit abgestützte China-Strategie zu entwickeln und sich konsequent daran zu orientieren. 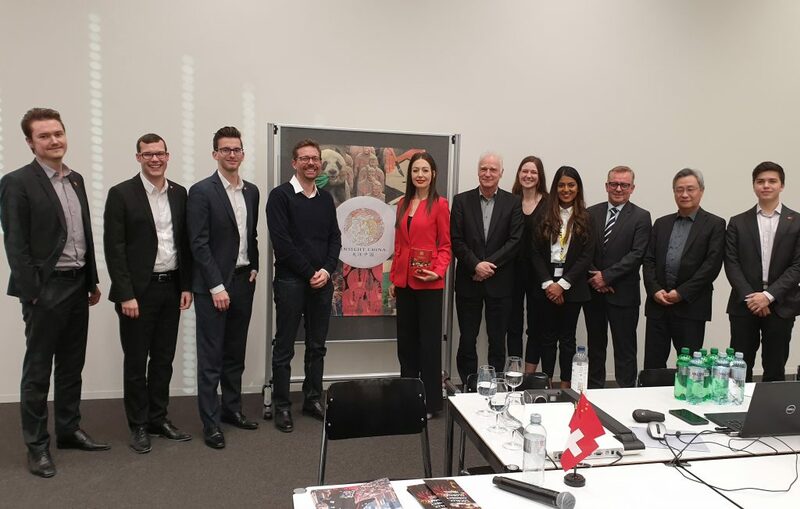 Der Event “Swiss China Update 2018” der FHNW vom 21. Juni in Olten versteht sich als Plattform für aktuelles Schweizer Wissen über China und seine Wirtschaft und Politik. Daher werden in diesem Jahr drei Schwerpunkte gesetzt: Im Wirtschaftsforum tauschen Schweizer KMU Erfahrungen und Perspektiven aus; im Tourismusforum erfahren Sie am Fallbeispiel Luzern, wie die Stadt mit ihren chinesischen Gästen umgeht; und das Partnerschaftsforum beschäftigt sich mit subnationalen Schweizer Partnerschaften mit chinesischen Städten und Provinzen. Die Hochschule für Wirtschaft FHNW unterhält seit 25 Jahren intensive Kontakte zu China. Aktuell verfügt sie über mehr als 20 Partnerschaften in 13 chinesischen Provinzen. Alljährlich besuchen 200 chinesische CEOs und Regierungsvertreter Weiterbildungsprogramme an der Hochschule in der Schweiz.